How are all my Happy Stampers today? I feel like the summer is passing me by way too quickly. I was hoping to take my daughter to the beach yesterday as it was supposed to be a nice day, but when I got up it was pouring rain. The weather dude totally missed this one. So what's a girl to do on a rainy day? Stamp, of course! Mmm, what yummy colors this week at Dynamic Duos! Blushing Bride always makes me think of, well, Blushing Brides. 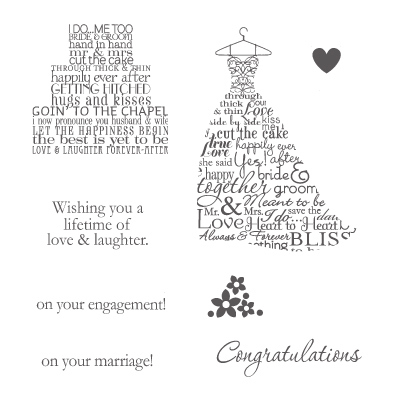 So I decided to use my Love & Laughter Stamp Set and coordinating Wedding Words Wheel Stamp for today's card. I went in search of a sketch for my project, and did a little happy dance when I found this one at Retro Sketches. Was it perfect, or what? 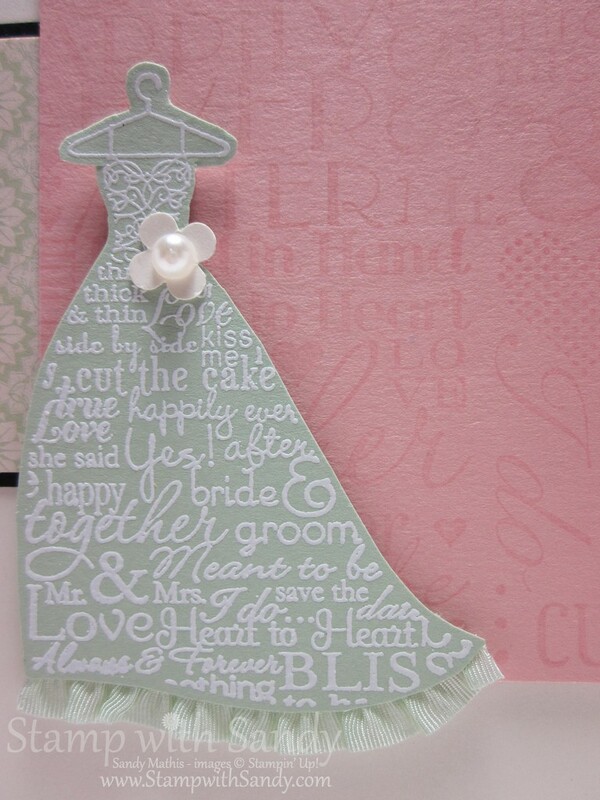 I love this little dress and while I was making it had visions of an entire bridal party in Pistachio Pudding gowns. The image was stamped with Versamark Ink and heat embossed with White Embossing Powder. I cut the dress out by hand, then added some Ruffled Ribbon to the bottom. A pearl embellished flower draws attention to the waist. 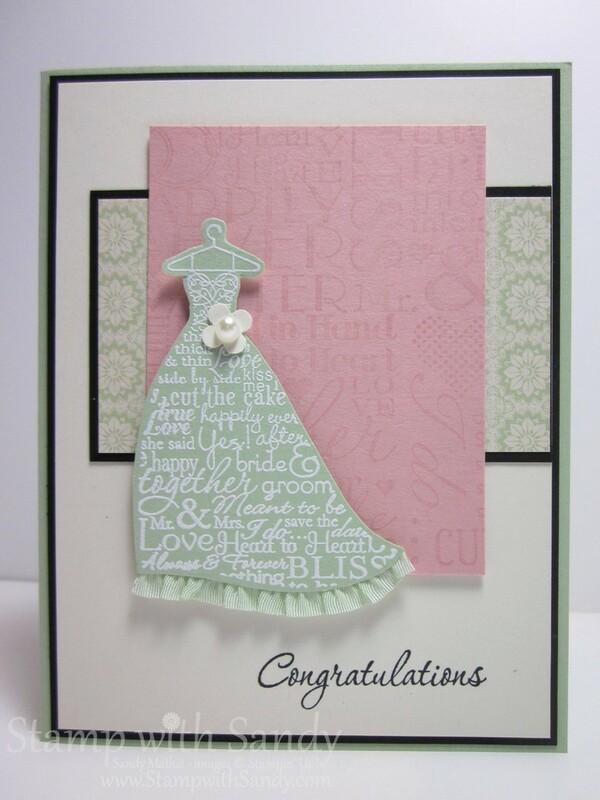 I wanted the stamping on the Blushing Bride layer to be very subtle so as not to take attention away from the dress, so I stamped it in Versamark Ink for some tone on tone action. I hope you like my Pistachio Bride! If so, please leave a comment! Wow Sandy! This dress is so, so pretty! 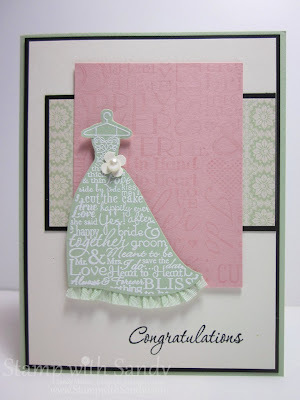 I love the white embossing AND that ruffle of ribbon. Gorgeous! 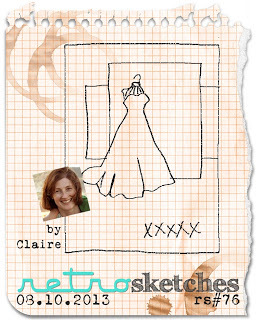 This all came together--the bride, the blushing bride, and that fabulous sketch. I just love it. This card is gorgeous! 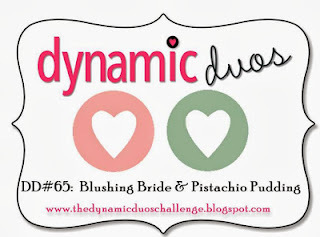 I adore the embossing and ruffle along the bottom of the dress :) Thanks so much for playing along with us at Dynamic Duos, we hope to see you back again soon!